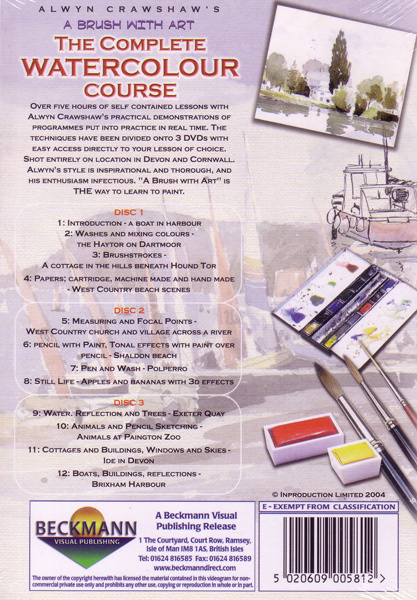 The Complete Watercolour Course - 3 disc DVD box set. Enjoy the relaxation, pleasure and sense of fulfillment that watercolour painting brings on holiday, in retirement or simply as a weekend hobby. Television artist and bestselling author Alwyn Crawshaw puts his experience and expertise into this comprehensive release, the perfect gift for anyone who wants to paint this summer and begin a new and creative pastime. 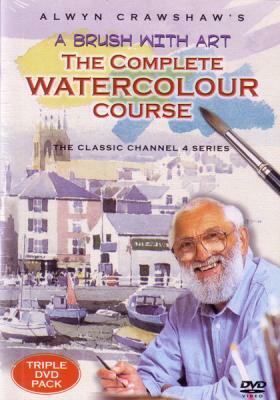 As a hobby or as a profession, you can take up watercolour painting to whatever degree you wish with the fantastic tips and advice on offer from Alwyn in this great release. Watch and learn as he shows you how by painting himself some scenes of opulent natural beauty. 1. Introduction - A boat in harbour. 2. Washes and mixing colours - the Haytor on Dartmoor. 3. Brushstrokes - A cottage in the hills beneath Hound Tor. 4. Papers; cartridge, machine made and hand made - West Country beach scenes. 5. Measuring and Focal Points - West Country church and village across a river. 6. Pencil with Paint - Tonal effects with paint over pencil - Shaldon Beach . 7. Pen and Wash - Polperro. 8. Still Life - Apples and bananas with 3D effects. 9. Water, Reflection and Trees - Exeter Quay. 10. Animals and Pencil Sketching - Animals at Paington Zoo. 11. Cottages and Buildings Windows and Skies - Ide in Devon. 12. Boats, Buildings, Reflections - Brixham Harbour. "...a very informative set, especially for beginners. Alwyn's enthusiasm shone through." Kate Cheasman, Green Pebble Magazine. Varied and valuble content. A good buy.